The ability to directly attach soft-tissue to metal would have broad clinical application. Tantalum is a transition metal, which in its bulk form has shown excellent biocompatibility and is safe to use in vivo as evidenced by its current application in pacemaker electrodes, cranioplasty plates, and as radiopaque markers. 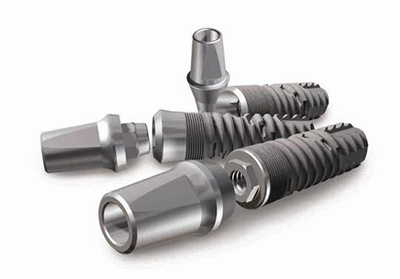 Current designs for orthopedic implants maintain a high volumetric porosity (70%-80%), low modulus of elasticity (3 MPa), and high frictional characteristics, making this metal conducive to biologic fixation. The low modulus of elasticity of such components allows for more physiologic load transfer and relative preservation of bone stock. In revision arthroplasty, it has been used as a structural bone graft substitute. Porous tantalum rod is a kind of alveolate rod structure with spongy bone structure. Its elasticity modulus is 3GPa, between spongy bone (1GPa)and Cortical bone(15GPa), which is lower than common titanium alloy filling material(110GPa) and can prevent stress-shielding effect. It has high volume voidage and full gap to achieve stable and high-speed bone growth. Also it has high attrition stability. Porous tantalum rod is mainly used to treat ischemic necrosis of femoral head. Ischemic necrosis of femoral head is kind of disease caused by caput femoris blood circulation disrupt. It can be occurred to any age, especially young people. There are the following ways to treat early stage ischemic necrosis of femoral head, reducing inner pressure of caput femoris, increasing caput femoris blood supply, reducing or slowing caput femoris transformation. Porous tantalum rod has good support for femoral head necrosis area, avoiding caput femoral from collapsing and helping femoral head necrosis area growing up. Porous tantalum can helps the cell proliferation, improve stone cell reconstruction capacity. According to the clinical trial result, tantalum filling material has good result in treating early stage caput femoral, its successful rate is obviously higher than fibula bone graft. Compared with traditional operation, Porous tantalum rod filling has the advantages of easy operation, short operation time(average operation time36min), small amount bleeding(average bleeding 70ml), little trauma, rapid postoperative recovery, short period in hospital. So it offered a new choice for the treatment of early stage caput femoral. Porous tantalum rod has below advantages in treating early stage caput femoral: 1, Medullary core decompression, reduce clinical symptoms of the patients,postpone total hip arthroplasty time. 2, Porous tantalum rod and bone graft have same stress and strain, it has same elasticity modulus with the stone. 3, Increase mechanical support for the feeble subchondral bone, prevent femoral head necrosis collapse and slow down the femoral head necrosis process. Because Porous tantalum has Elasticity, it will not break when interface with cortical bone of high elastic modulus. It helps Porous tantalum Acetabulum shield and synostosis Acetabulum can match well and improve the primary stablity of filling material and reduce bone fracture possibility. In addition, porous tantalum has higher friction coefficient than other materials, take spongy bone and cortical bone for example, friction coefficient for Porous tantalum is 0.88 and 0.74, it is 40-80 higher than other treatments, which helps its primary stability after filling in. Press High molecula and high density Polyethylene on the material made up of Porous tantalum can make porous tantalum acetabulum cover.Compared with solid flat metal acetabulum cover, the integrative design is more elastic and more suitable for the human body physiology. Also it can transfer the load evenly to the surrounding skeleton. The integrality of Polyethylene and Porous tantalum avoids abrasion of Porous tantalum bottom and body fluid flow through the screw holes. Relevant operation test testify there is no malposition and aseptic loosening phenomena. Designers have referred to the porous tantalum acetabulum cover to design porous tantalum- polyethylene integrative tibia joint platform. The design has lower modulus of elasticity than traditional material, which helps to reduce the stress-shielding effect to the surrounding tibia. In addition, Femoral cones, tibia and patella Composite joints have good filling results without complication. When Porous tantalum were used in total knee replacement operation, it offered enough support and bones healing well, no phenomenon of aseptic loosening. Patients are very satisfied with it. Moreover, patients have smaller bone mineral density drop than using cobalt-chromium alloys. Because of the sluggishness of tantalum, Porous tantalum have fine mechanical property and Biocompatibility, it will play a greater role in the Artificial joints field. Although porous tantalum is in its early stages of evolution, the initial clinical data and basic science studies support its use as an alternative to traditional orthopedic implant materials.